This semi precious gemstone necklace is STUNNING! I created this necklace with three all natural stones...tanzanite, angelite and blue lace agate. 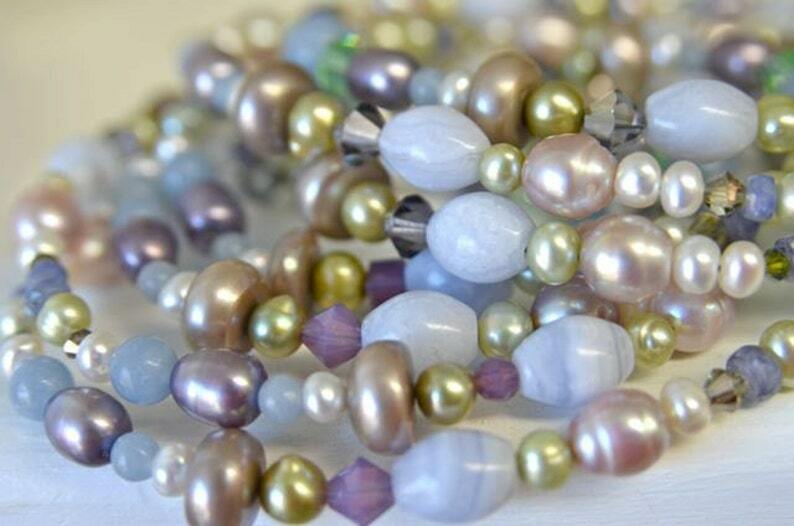 In addition to these beautiful stones I used 148 freshwater pearls and 60 Swarovski crystals. If you need specific sizes, send me a convo and I will send you the info. This amazing necklace is 60 inches (152.4cm) long and has a lead free pewter toggle clasp as a closure. The earrings are created with Swarovski crystals, freshwater pearls and natural tanzanite. They hang 1.75 inches (4.4cm) long and have rhodium plated lever back ear wires for your comfort and security.